As part of our VIDEO TRIALS, it is time to examine impact resistance. This is one of the main properties that differentiate it from other materials, and one of the differentiating properties when compared with other conventional solid surfaces. 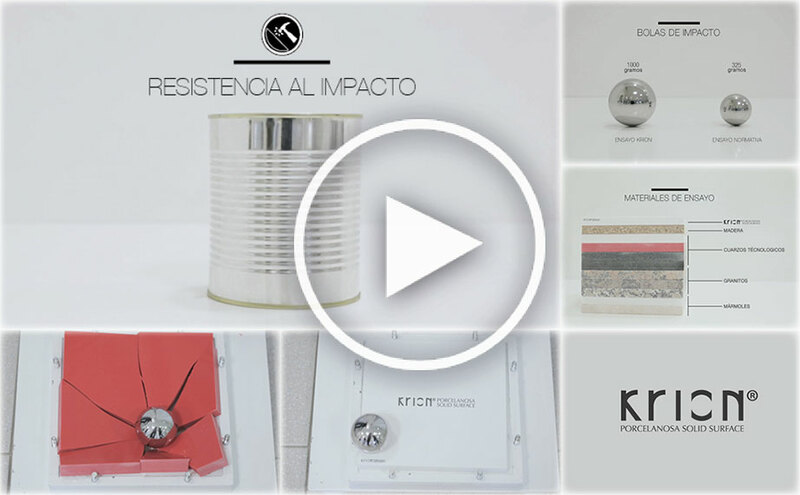 “Impact Resistance”: Various impact resistance tests are carried out on the compact mineral from PORCELANOSA Group, KRION®, both internally and by certifying companies. The overwhelming results show that KRION® is a material which has a very high impact resistance. Its exclusive formulation and the high quality of its raw materials give it the ability to absorb impacts without breaking. For this reason, and many others, KRION® is a New Generation solid surface. In this video we are going to see one of the more visual trials, the impact test. For this, we are going to use 1000 gram metal spheres (the regulation requires 325 grams), and a height of 2 metres (the regulation requires 1.3 metres). Don’t miss out on seeing the results of KRION® and other materials.